Ultimately, it is nice to know that I can practice what I preach. (Practice! Literally!) Puccini and I spent some good quality time together these last few days, and I am looking forward to playing the Butterfly Duet tomorrow. The singers are truly wonderful and I just hope to get out of their way and let the music happen (while playing crazy 16th notes at MM=104 in a manner that feels “Andantino”). And while I spend the day teaching tomorrow, I will give my students the practicing speech with added gusto and authority! 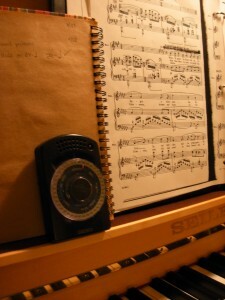 This entry was posted in practicing and tagged accompanying, metronome, performance, practice, puccini. Bookmark the permalink. Great post! Isn’t it wonderful when we are able to have the time or a good reason to “practice” what we preach? Truly, there’s nothing like a concrete goal, i.e. a rapidly approaching performance, to make one’s practice the most efficient possible! All the best tomorrow night! Thanks everybody for your supportive comments! The concert went well and while my playing wasn’t flawless, I was really happy with what I was able to accomplish via my “organized practice” efforts!